This episode is perhaps the only Backyardigans episode to blatantly teach a lesson, even distinguishing itself from “Pirate Treasure,” in which the sharing theme was shown by having the characters work together, not being told that it’s something they ought to do. Most children’s shows fall into this trope – which has been described as having all the grace and subtlety of a falling anvil – and that’s why it is especially jarring for it to pop up on a more sophisticated, story-oriented show like The Backyardigans. 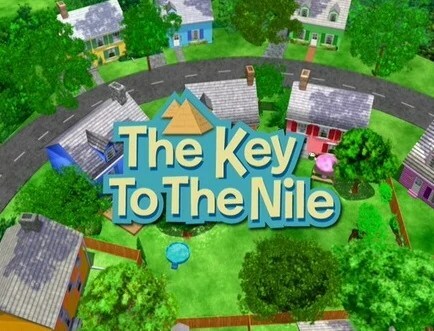 The very obvious moral of “The Key to the Nile,” is the importance of saying, “please,” and “thank you,” and it basically takes the phrase, “say the magic word,” to the next level. Now, of course, this is not a bad lesson to teach, and the fact that it has quite a lovely song to enhance its importance is typical of the Backyardigans style. It also shows how rudeness can really hurt others. “Please” and “thank you” are not only literal magic words in the story, but phrases of appreciation: we shouldn’t use manners as a means to get whatever we want, but to demonstrate a level of respect to whomever we’re addressing. This sort of “Aesoping” tends to be aggressive and only the aggrieved sideglances to the camera by the three boys relieves its heaviness. Happily, this episode makes up for this with clever dialogue, many catchy songs, and the introduction of the characters performing. One of the most unique things about this episode is that it’s the start of the characters actually acting. Yes, we know Tasha can be a bit demanding and little dramatic, but she’s certainly not rude or mean. None of the characters are, and it would be a rather bland series if all the characters were perfect angels all the time – after all, where would the lesson be? So instead of introducing confusing new characters each episode, the writers have taken the power of imagination to the next step, and have the Fab Five not only change their surroundings, but also themselves. It’s not only excellent storytelling, it also keeps the series from repetition and overall saccharine sweetness. You may to discuss with your children that the characters are not “changing,” just acting, being helped that Tasha actually changes her name to “Princess Cleotasha” to further differentiate her true self from her story self. As stated above, the real jewel of “The Key to the Nile” is the wonderful musical utilization of the Broadway musical, especially that of Rodgers and Hammerstein. There are no less than four different songs, each with multiple reprises – which is not surprising, given the genre. “Please and Thank You” (the tune perhaps better known to some adults as “Shine On, Harvest Moon”) is naturally the best one to sing along with your kids, not only for the subject matter, but because, in best Broadway tradition, the others are there to advance the plot and not as stand-alones. We now have finished the It’s Great to be a Ghost DVD, and will now continue our Backyardigans adventure on The Snow Fort DVD, which contains the titular episode, “The Yeti,” “Knights Are Brave and Strong,” and “Secret Mission.” So watch this space next week for “The Snow Fort”! How do you prefer teaching your children about manners?